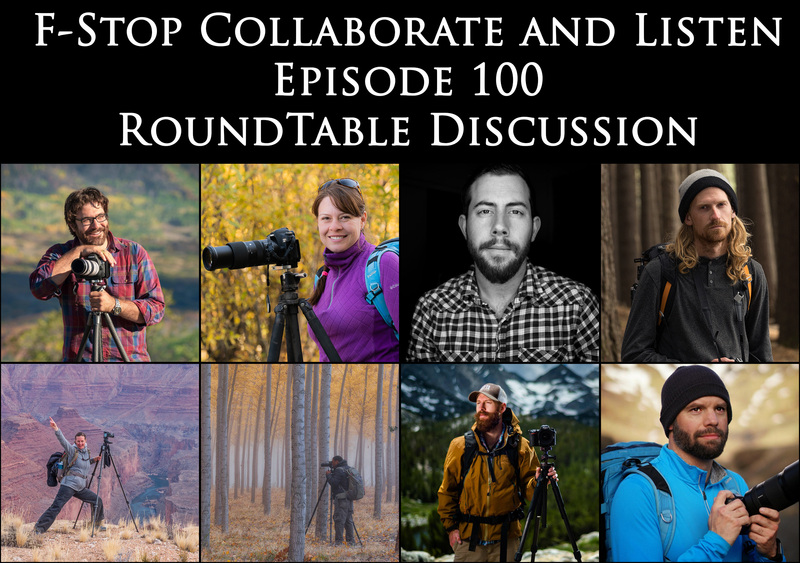 Welcome to Episode 100 of the F-Stop Collaborate and Listen podcast featuring a round-table panel discussion with David Thompson, Alex Noriega, Eric Bennett, Sarah Marino, Colleen Miniuk-Sperry, Michael Shainblum & Joshua Cripps! We invited students of our featured guests to participate and ask questions of the round-table, including Nic Stover, Carolyn Cheng, Brent Clark, and Gareth Coggan. In all, we had 12 people participate in this episode! To get these discounts, simply sign up as a Patron of the podcast at the $5/mo or higher level before April 30, 2019. Your discount codes will revealed after you sign up. We are also happy to report that Jason Matias has re-opened access to his Art of Selling Art service but only to podcast listeners. Signing up for his service benefits you in many ways if you are someone looking to sell your artwork. Also, signing up helps out the podcast! Win! 1. Have you noticed any shifts in the landscape photography community as it relates to topics that have emerged here on the podcast? 2. How would you rate the state of Creativity in landscape photography? 3. Who influences you the most and why? 4. How do you imagine Landscape Photography in 10 years? 5. Where do you feel weakest as a landscape photographer? 6. In the early history of photography, photographers played a vital role in the preservation of wild lands. This continued to a small degree over the last century but more recently has been forgotten. Do you think we have a role to play in this arena today? If yes, what should it look like? How do we go about retaking that role? Please consider supporting the podcast on Patreon! There's a ton of bonus content over there for subscribers! Your support is critical - it helps with production costs and to improve the podcast over time. Thanks! Even $1 / mo helps a lot! We are growing closer to our goal of getting to $1,000/mo in support, at which point I will create an award to be given to a photographer that is a champion of conservation. Help us get there! I love hearing from the podcast listeners! Reach out to me via Instagram, Facebook, or Twitter if you'd like to be on the podcast or if you have an idea of a topic we can talk about. You can also join the conversation on our Facebook Group! We've also started an Instagram page and a Facebook page for the podcast, where we'll be sharing updates as we go! As a reminder, you can also support the podcast by shopping at B+H for your photography gear using our Affiliate Link.